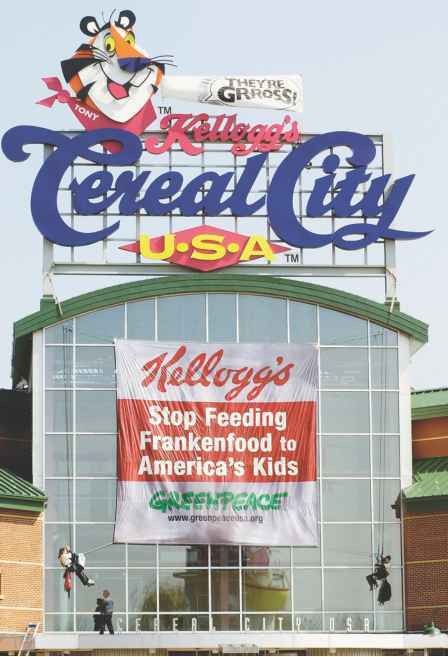 Greenpeace activists hang a banner on Kellogg's "Cereal City," a company museum in Battlecreek, Michigan. Greenpeace asked Kellogg's to stop what Greenpeace perceived as Kellogg's double standard regarding genetically modified ingredients in March 2000.
that produces a toxin, while allowing marketing of a transgenic potato that has a high starch level and therefore absorbs less cooking oil, and is nontoxic. The FDA and U.S. Department of Agriculture approved transgenic crops in 1994, and deregulated the technology two years later, as did the U.S. Environmental Protection Agency. Ironically, as people in wealthier nations object to not having a choice in avoiding genetically modified foods, others complain that the technology is too expensive for farmers in developing nations to use.